Autumnpeak is a small coastal town, occupying the south banks of the Autumn River's mouth as it feeds into an inland sea. It enjoys a fair trade but its small harborage and geographic isolation prevent it from becoming a bustling city. Pineford is a small village, a few days travel away, that their main export is wool from the sheep they raise. Kingsholm is a small village that grew up on the edge of an ancient dwarven kingdom that left the area centuries ago due to the mines being worked out and monsters invaded the mines. Rumor is the Dwarves traveled down the mountain range to live in their southern region of their kingdom. Halflings have established a small robust shire in the rolling hills north of Autumnpeak. Elvish tribes are known to travel and live in the forest south of Autumnpeak. They have some hidden cities deep in the forest away from most humans but they also claim a section of the open plains where they have crops growing. There are several small human settlements on the edge of the forest. 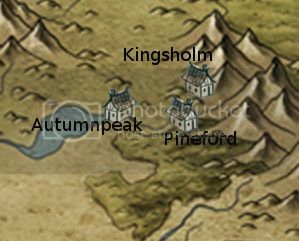 Autumnpeak is the last bastion of civilization as travelers from the more established kingdoms would call it. It enjoys the relative safety of its position, surrounded by dangerous countryside. Depending on your direction of travel, Autumnpeak is either your last stop to nowhere or first stop to somewhere. Free of royals or nobles, many folk enjoy the loud, boisterous culture that's erupted in the absence of a "cultured" authority. Locals often shorten the village's name to "Autumn," and enjoy confounding the few new arrivals with phrases that could refer to either the village or the season, “There's never nothing to do in Autumn”. Over sea passage back to the more established and older kingdoms, sometimes referred to as civilization, is expensive. Autumnpeak is full of folk who are stuck there wishing they had the coin to leave the frontier. Many of the sheltered townsfolk are “eager for civilized news." Winters in Autumnpeak are harsh and unrelenting. Folks learned long ago to work hard during summer, harvest well during fall and ride out the harsh winters. These days, more than a century after Autumnpeak's founding, that behavior is less an accepted way of life. Many are those who enjoy the long winter spent indoors, huddled up before a merry fire. Even the landowners, who oversee the farms outside the town, winter within the walls of Autumnpeak where life slows to a comfortable crawl. The low walls around the town do not hide the reverie inside. Banners and pennants in red, orange and yellow flutter in the cool afternoon breeze atop almost every structure. You pass through an open gate and under a hand-carved sign that reads 'Welcome to Autumnpeak'. Your hand reaches down and checks for yet a third time the purse you have your meager amount of coins in to be sure they are still there. 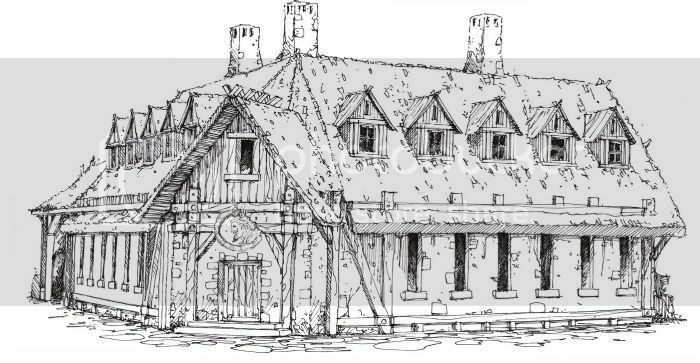 With yesterday being your last day of chores and being release from your apprenticeship for the festival, you already paid for your room and board at the Broken Coin Inn next to the gate. You can hear the festival from the front of the Inn... raucous laughter, shrieks of glee, the clang of metal and shouts of victory. Before long, you also smell it... the hot, spicy smell of a dozen vendors smoking a dozen meats over a dozen fires. When you see the festival, you notice that the tents are a little more rag-tag than last year... thoroughly worn and patched... but still usable. Everyone seems very happy to see each other and the rules of the games are called out to those who step up to play them. They are really having fun and enjoying the beginning of the festival. Iloparin checks his clothes to ensure everything is in order. The light of adventure in his eyes and he can hardly contain himself. He fidgets with his belt and the cuff of his shirt. The thought of visiting the festival alone, for the first time is almost more than he can stand, and he quickly walks away closing the door to his room. The sights and sounds of the festival wash over Iloparin as the smells of the various foods cooking make his mouth water even after eating a hearty meal just recently. Crowds of the Autumnpeak locals rush about, kids clutching a copper coin in their sweaty hands rush off with their friends for some child games like Jacob's ladder or ratpucking. Iloparin locates the Now you see it, Now you don't and places his bet. The small smiling halfling lady continues to call out to the others in the crowd to place their bets and a few others do but once the cups are lifted only Iloparin has the coin in front of where the ball was. With a smile the lady slides a coin next to Iloparin's and says with a smirking grin “Beginner's luck. Try again?” as she covers the ball and starts a quick shuffle of cups again while calling out to the crowd “Is the hand quicker than the eye? Come see and place your coin where you think the ball is at”. Tanya tries not to squeal too loudly when Enddom hangs the rarely used "Closed" sign on the tavern door. "I'll meet you there!" she exclaims to the rest of the group as she bolts home, just to find her younger siblings have already left for the festival. She rolls her eyes and starts bouncing to the festival grounds. "Hiya Tess!" she calls out as she walks by the shell game. She declines Tessa's offer at a game with some eyerolling and a giggle, and then hits a crossroads. Archery, or singing, or the brawl? Dang! It's so hard to decide! She finally decides to register for the talent show and the dueling, and then will rush to archery, trying to finish it off before the other two events begin. She stops first at the registration for the dueling circle. "One gold, hereya go!" She looks at the padded swords, trying to figure out if she can use one in each hand like Valon taught her. Turning, she spies him preparing the weapons. "Hey Valon. How do you think I'll do with the fighting? I've been practicing the trick move you taught me." she says as she pays up her 1gp to the registrar. She carefully listens to the instructions and what time to return, then rushes off to register for the talent show. "Mayor Highwood, I'd like to sing for the talent show. Can I sign up for this afternoon? And is it ok if Bethel signs backup? I don't know what song I'm singing yet, but some of my favorites kinda need them. Oh, I should ask the judges later? Ok, I can do that. Thanks!" With a wave to Enddom who is signing up other contestants at another table, she then rushes off to the archery range. "Ok McGee, give me a full flight. I'm gonna win me a new bow today!" Tanya will put two of her precious gold crowns down on the table, blow a kiss at Taran working nearby, and try her best to hit three bullseyes... or at least one. Enddom trys to remind Tanya “Remember the tavern opens up during high sun for midday meals and drinks and we reopen in the evening for the nightly meal time” as she bolts out the door. Short time later as Tanya is seen hurrying through the festival crowd, calling out to various people she knows, she slows down enough to catch Tess telling a stranger “Beginner's luck, wanna try again” only to realize that Tessa is playing with this guy then suddenly remembering what time it was she rushes off with a giggle and almost runs all the way to the dueling table where she signs up after paying her gold and listening to the rules that she remember from the last festival. Valon smiles as Tanya calls out and approaches then gets a thoughtful looking on his face when asked about her chances “You got some fair chance unless that Brandon boy gets paired up against you. He's quick and can hit hard, even with a padded sword, since his father hired that tutor from over seas. I would save that trick till you absolutely need it for if you mess it up, you are left open completely”. With that Tanya waves bye to Valon and hurries off to the talent show table where she finds Ryne Highwood and Enddom signing up contestants. Rayne smiles at Tanya but shakes her head at the request for the afternoon “I'm so sorry Tanya but all the days slots are full. We have a few slots open just midday meal and unlike last year's festival, we are making this talent show a solo performance” and listens to the question about asking the judges later “Well you can ask Tink since he is sponsoring the show, he will be a judge. Abe agreed to be another judge and we have a surprise judge. There is a traveling bard that just arrived today in town and he agreed to be the third judge.” With that in mind, Tanya moves over to the table and signs up then rushes off with a wave towards the archery range. Where glancing up at the sun, she realizes she only has a few hours left before having to sing and what did Enddom yell at her this morning, it was something to do about the tavern and midday meals. McGee chuckles at her comment as he hands the arrows and bow to Tanya then frowns at the kiss blown towards Taran, who is working the swinging blocks. Without warning he spins about and yells at Taran to move off the blocks and Keebler take over on the blocks then turns back to Tanya and smiles at her before she moves over to the shooting line to wait her turn next. Ugh, am I going to be late for the lunch shift? Tanya thinks, as she's trying not to fidget in line. I hope not. If I come back with a bow, he'll probably forgive me... but if I come back emptyhanded, he'll be grumpy twice over, once for me being late and once for me not hitting the bullseye. She'll get back to thinking about the targets, and maybe do something to calm McGee's annoyance. He's just thinking that guards should be all stoic while on duty... I wish he'd get a clue about Bethel's intentions. Wait, no. I'm focusing on archery. Ar-che-ry. And with that, she pushes out most of the world out of her immediate attention. The old man in front of her takes his time with his shots. As each arrow misses all the targets, the surrounding crowd jeers and hoots at him. With his last arrow let loose, it sails between the swinging blocks and embeds itself solidly into the outermost ring of the far target. With a smile, McGee takes the bow back and hands the old man a chit "Herman, you take this to the treasury shed and they will give you your winnings so don't lose this. It is worth 5 crowns" (gp). The old man grins and pockets the chit before heading off to get something to drink. McGee calls out "Next" and gestures to Tanya to step up while Tanar collects the arrows and Keebler sets the blocks swinging. When the guards are out of the range, McGee calls out "Clear to fire" and steps back from the firing line to get a clear area to the shooter. As her first flight all goes wide, Tanya squelches a dammit thought then blushes. "I guess I'll need the second flight." she says as she ponies up a second coin, trying to sound upbeat. She squeals in excitement when she nails the bullseye, and tries not to look disappointed when the next shot goes wide. As she collects her winnings, she says "Thanks McGee! I'll put it to good use! And I couldn't have had a better spotter than you. When I bag my next pheasant, I'll send a pie over." And Bethel will be my delivery dame. she adds in her head. With a wave to the guards and a smile at Taran (when McGee isn't looking), she'll set the bow down and move away from the line. Oh, I'll be not too late if I hurry! She'll quickly cash in her earnings at the moneylender and Karistol's, then race back to the Broken Coin as fast as she can manage, careful to not knock anyone over (or lose her purse) in the process. She pauses right outside the inn to catch her breath, then heads inside. She ignores Enddom's stern look and instead flashes a big smile at him. Holding her (short? long?) bow up, she exclaims "I won!" loud enough for all of the inn to hear, but it's meant mostly for Enddom and Bethel (and the other staff, if they're around). Before Enddom can say anything, she'll follow up with "Next round is on me! Enddom, line 'em up!" She'll put the bow next to Enddom's crossbow behind the bar, and then start serving the beer. She has a fleeting thought of I should have bought some arrows at Karistol's before the effort of working the tables takes over. (and I'll pause here until Enddom closes up again so she can race back for more events). Last edited by Woe on Wed Dec 02, 2015 2:17 am, edited 4 times in total.